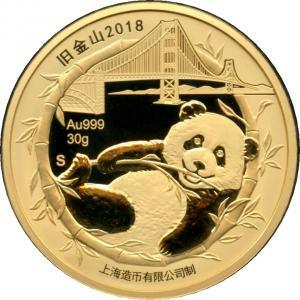 For the first time in 30 years, the Shanghai mint has minted official pandas1 in gold and silver for the San Francisco bay area. The last time a panda was minted was in 1987, followed by a 1 ounce gold dragon in 1988. The newest issue will be the 2018 San Francisco Panda to be distributed at the CoinExpo2 Santa Clara on September 21st, 2018. Included are gold and silver versions honoring San Francisco's Chinatown and one featuring a large dragon boat. The pandas can be purchased at the CoinExpo Santa Clara coin show, but for the many people who can't attend the show in California, they can pre-order3 online and have them shipped.